Mention the date of April 15, 2011 to any USA-based online poker player and watch the blood drain from their face. That was the fateful day it was decreed that online poker was a form of gambling (and not, as had been argued, a game of skill that just happened to involve money) in the United States, and as it was illegal to use bank accounts in the United States to transfer funds to and from gambling activities, several of the big poker sites, such as PokerStars, Full Tilt Poker and PartyPoker, were forced to close payment transaction facilities to their players else face huge penalties. Millions of online poker players in the United States were suddenly locked out overnight. It has taken some time, but finally some casinos are being allowed to operate online again, as long as they comply with strict United States regulations. Leading the way is Bovada Poker, which has fast become the most popular online poker room for players in the United States. When you visit the Bovada site you'll be presented with several options to enable you to download the poker client. Sadly, there is no in-browser version, but there is a special version for Mac users to download and install. The Bovada poker client is only 5MB and should download without any difficulties. Once you've downloaded it, simply click on it to begin the install. Initial installation is very quick, but don't be fooled - as usual, this is a conduit program that serves as the downloader to the much larger Bovada client, which will then download and install on your computer. I've some great news for Linux users - I got the Bovada client to work flawlessly under Wine! Great times! Once the poker client has done what it needs to do, it will start up. You will see the login section to the left, and a big red button marked "Join Now" - click on this to begin your registration. All you need to do is fill in your name, address and email. A validation email will be sent to you so you can confirm your account. Once you do this you can start to use the Bovada poker client. To start things off at Bovada poker, the site offers you a tasty 100 percent Welcome Bonus up to a maximum of $1,000. You can make as many deposits as you want for this bonus, but only those that occur on the same day as your first deposit will count towards your first deposit bonus. Bonus payments are released in six different stages, and you release each stage by acquiring Poker Points. A mere 50 Poker Points will see you obtain a $10 bonus, whilst 5,000 Poker Points will see the final, $400 bonus released to you. You have sixty days in which to release as much of your bonus as you can. If you are halfway between stages when your sixty days are up, you will not be short changed! Any Poker Points you have remaining will be exchanged for bonus cash at the rate of $1 for every five Poker Points. You earn Poker Points at the approximate rate of three points for every $1 you spend on tournament fees, and one point for every $1 of rake generated. As well as the First Deposit Bonus, new players also receive an entry into the Sunday $100k New Player freeroll tournament, and if you're ever lucky enough to get a Royal Flush whilst playing at Bovada, you can claim up a bonus worth up to $200! 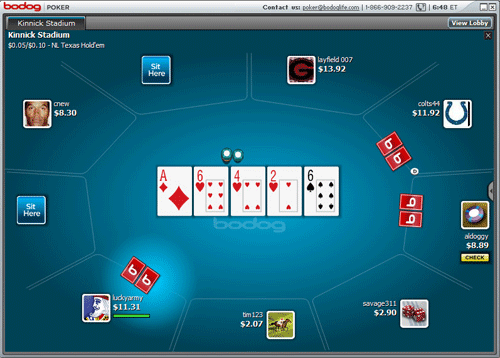 I must admit I fell in love with the Bovada poker client immediately. It's big and bold and not overwhelmed by adverts. There's a very handy menu at the top of the screen which allows you to select the type of game you want, then the poker variation you're looking for and the buy-in amounts. As a Blackjack fan I was very happy to see a few Blackjack tables available! All your account details are presented on the left-hand side of the screen, including your current cash balance, the tournament tickets you've either won or been given, your current Poker Points balance and even your Play Money balance. There seemed a huge amount of tables available for all types and monetary values. All very impressive and extremely easy to use. I was a bit trepidatious about sitting down at a Bovada poker table as I had been really impressed with everything so far - I didn't want the actual playing experience to turn out to be complete damp squib. As usual, I wanted to try things out with Play Money before committing the cash, so I switched over to the Play Money section to see what was going down. There were quite a number of Play Money cash games, but I don't see the point in playing ring games for pretend dosh, so I found a six-seater SnG (which is my second favorite type of game behind Heads-Up), registered, and waited for play to commence. The table filled up in five minutes and we were off ... and ... I wasn't thrilled. Bovada had taken a very futurist approach to the game screen. There was no table, just sections in which the cards appeared. There were no player names, just numbers (although this might just be for Play Money games). To me, it just looked like I was playing in a kind of game show, rather than poker! I didn't like how the controls were set up either, and I couldn't find any way of altering them. I later found you could change the background image (I chose a nice baseball one) and the card deck and a few other options, but overall, I wasn't impressed. At present, Bovada is only really open to players from the United States and Canada. If you try to register from another country you will directed towards the Bovada's sister site, Bodog. Bovada does not operate a VIP scheme, and the only real promotions are those for new players, and the weekly $5,000 freerolls which you can enter if you have amassed enough Poker Points during the week. There are also special qualifiers open for WSoP events, and other special events throughout the year. There isn't a dedicated mobile client, but you can use Bovada poker on your mobile device by visiting the Bovada site, although saying that I could not get it to work on my Android tablet. I am afraid this is another area where Bovada seem to be lacking. There is no online support - the best you can expect is an email address. There are some FAQs on the website, but they are very brief and are more concerned with poker as a whole, rather then specific Bovada queries. I suppose if I was a USA-based player, I'd be thankful for any opportunity to be able to play online Poker. Things were progressing really promisingly as I was writing this review, and I'm always impressed by poker rooms that offer their clients for Mac, and that work under Linux. I was also impressed by the poker client itself. Things just started to unravel once I reached the table, as I just didn't like it. I've played at numerous poker rooms, and am pretty hard to please when it comes to the table, so perhaps I was just being a bit over-sensitive, but I just could not help but be disappointed by the playing software. A few additions though and it would be perfectly fine. Help and support was almost non-existent. In summary, if you're a USA-based player I guess you're going to take whatever you can at the moment, and whilst there is nothing at all wrong with Bovada Poker, and there is certainly a lot that can be said that's positive, I can't help but feel Bovada just needs to put a little more effort in if it is ever going to be able to start rubbing shoulders with the big boys like PokerStars. Top poker for those of us who live in the US and suffered from Black Friday.